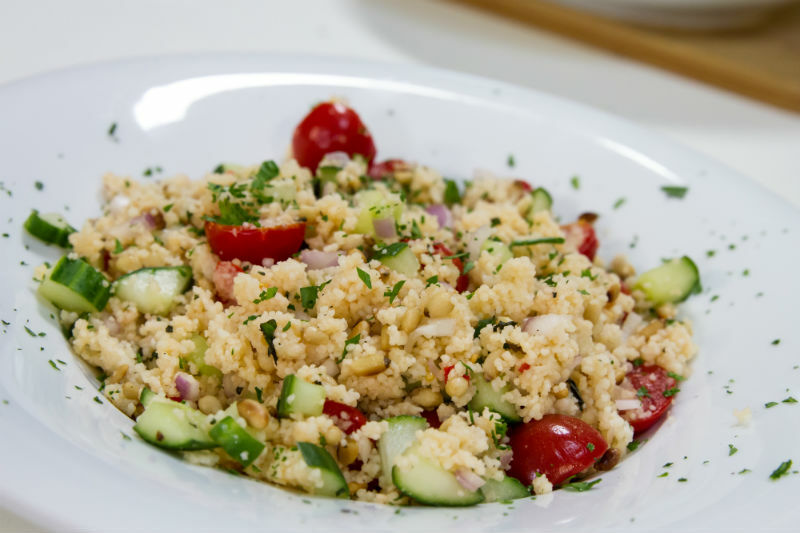 An easy and excellent couscous salad that you must try! Mint and pine nuts are great flavour enhancers. YUMMY! 1. Toss the tomatoes, cucumbers, and lemon juice in a bowl with 2 teaspoons of the salt. Set aside. 2. Put the couscous into a large bowl. 3. Bring the water, lemon zest, 3 tablespoons of the oil, the remaining salt, chilli, and herb stems to a boil over high heat. 4. Pour the liquid over the couscous, stir to separate any clumps. 5. Cover with a lid, plate, or plastic wrap and set aside for 5 minutes. 6. Remove the zest and herb stems and fluff with a fork. 7. Add the tomato mixture, scallions, mint, parsley, and pine nuts. 8. Drizzle the remaining oil over the salad, toss and serve.